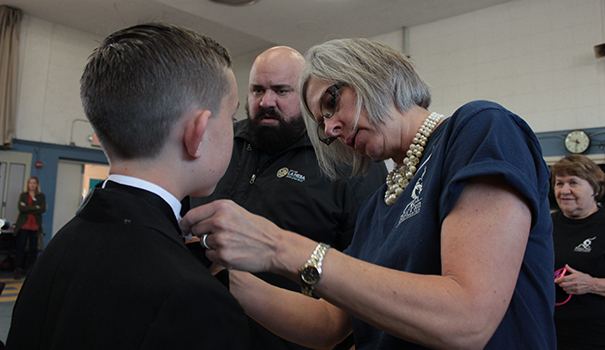 The 90 children currently rehearsing for the Peter Pan Junior Theater’s upcoming production of “My Fair Lady” not only have to learn their lines and choreography, but, in some cases, how to dress themselves. 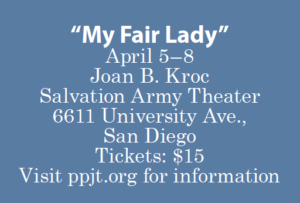 The production will run April 5-8 at the Joan B. Kroc Salvation Army Theater and, as always, the young thespians learn more than just their lines (or how to put on period attire). Henry Higgins, the play’s leading character is a linguist able to pinpoint where a person lives based on the accent. To that end, some of the actors are learning to speak in multiple British dialects. Arapostathis is using this aspect of the play to teach about how language influences class distinctions. “We separate class by language,” Arapostathis said. “One of the examples I use is my own family. I come from Greek immigrants and there are many people in my family who have thick Greek accents who are very scholarly. 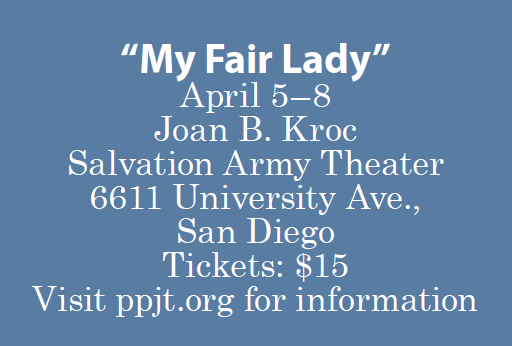 This marks the third time Peter Pan Junior Theater has done “My Fair Lady” in its 47-year history. It also marks Arapostathis’ 24th show with the company. Jokes about getting dressed aside, he says the real challenge for the young actors is understanding how to play adult characters. Tickets to the four evening shows and one Saturday matinee are $15 each. In addition, the students will perform free shows for fifth graders in the La Mesa-Spring Valley School District. “There is a resurgence nationwide because clips are available on YouTube and Periscope, but they only know certain musicials,” he said. “They don’t know ‘Oklahoma,’ ‘Cats,’ or who Rodgers and Hammerstein are. Performances for the show begin at 7 p.m. for the evening shows, 1 p.m. for the matinee. For more information, check out ppjt.org. —David Moye is a freelance writer based in La Mesa. reach him at moyemail@cox.net. Great article. Love these shows. Kids do an amazing job. One correction, the lady is Rhonda Archer. She is the wardrobe mistress. The change has been made. Thank you for letting us know!